James MacGregor Burns and Peter Senge have been two of the most influential writers on leadership over the past 40 years. 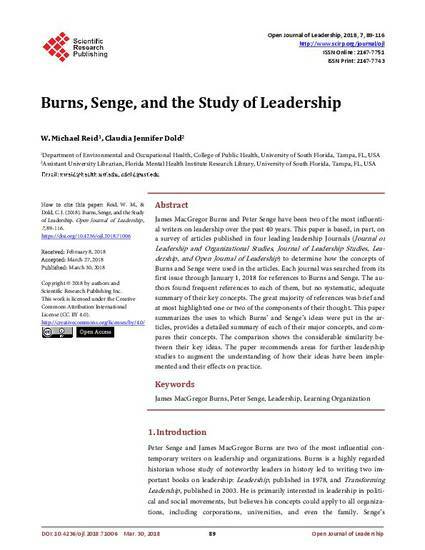 This paper is based, in part, on a survey of articles published in four leading leadership Journals (Journal of Leadership and Organizational Studies, Journal of Leadership Studies, Leadership, and Open Journal of Leadership) to determine how the concepts of Burns and Senge were used in the articles. Each journal was searched from its first issue through January 1, 2018 for references to Burns and Senge. The authors found frequent references to each of them, but no systematic, adequate summary of their key concepts. The great majority of references was brief and at most highlighted one or two of the components of their thought. This paper summarizes the uses to which Burns’ and Senge’s ideas were put in the articles, provides a detailed summary of each of their major concepts, and compares their concepts. The comparison shows the considerable similarity between their key ideas. The paper recommends areas for further leadership studies to augment the understanding of how their ideas have been implemented and their effects on practice.